If truth is the first casualty of war, what are we to say about a symphony that is freighted with meaning like perhaps no other, a symphony that—between impassioned performance and rapturous reception—evidently retains a compelling grasp on the public imagination despite the passage of time and the continuing metamorphosis of history? The city's name reverted to St Petersburg when the Soviet empire crumbled, but the symphony remained 'Leningrad'—an idea, a memory; maybe an aspiration, certainly a symbol. As such, it is a work of complex and inconclusive meaning. There are the forces, for a start. Over a hundred musicians were onstage at the Usher Hall, including a sixty-strong string section, heard to magnificent effect in the first half performance of Dvorák's Serenade for Strings. Given the scale of the Leningrad, one might say that the Dvorák was a bonus; a welcome bonus at that (no such bonus at last year's equivalent blockbuster, Mahler's 6th). The enormous string sound generated by the available section brings a sensual glow to Dvorák's deliriously limpid lyricism, but there is a price. With the weight comes a certain sluggishness, which was particularly evident in the third movement, not coincidentally the liveliest of the five. Whether it is a price worth paying, that's a topic for interval conversation, though I suspect answered in the affirmative. That tendency to affirm, though, is part of the difficulty when it comes to evaluating the Leningrad. There is much that is not in doubt: the circumstances of its first performance, the reception it received in Britain and the United States. 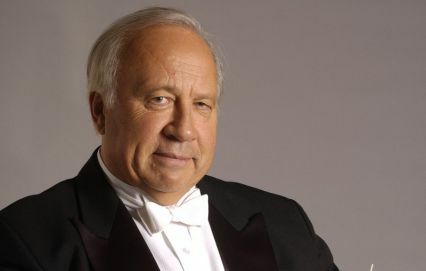 Counterpointing that there is the local history of Neeme Järvi’s championing of the work with the RSNO in famously blistering performances of the past. Then there is the special bond between Glasgow and Leningrad, represented in the concert programme by the 'Leningrad Album' received from the wartime city in gratitude for the Second City's solidarity. The strange thing is, though, that the symphony's tremendous emotional heft seems to come from elements that are more to do with sheer musicianship—and, dare one say, exactly the formalism that would be the claim made in the second bullying denunciation that the composer endured in 1948. They had him bang to rights, but the same could be said of anyone who could compose a sentence on a typewriter. The famous invasion theme in its melodic outline has been attributed to various sources, conflating Lehar, Glinka, Haydn, and who knows who else. More obviously the whole invasion episode parodies Ravel's Bolero, and that is a puzzle: at the climax of Shostakovich’s design, we experience the crunching modulation; it is there in Ravel, but Shostakovich makes something far darker of it. But is the allusion intentional? If so, what is the message? The perception of formalism extends forwards as well as back. Bartok appears to have appropriated certain elements of the Leningrad for the work that became one of his most readily accessible, the Concerto for Orchestra. One of the most striking things about hearing the Leningrad in performance concerns the stories about Bartok's Concerto, specifically the one about the fourth movement 'sending up' Shostakovich's theme as a comment on the symphony’s rapid popularity. Close listening persuades one that Bartok paid careful attention to the Leningrad. One cannot say that he was obsessed by it, but Shostakovich’s theme is certainly present in the fourth movement of the Concerto, and it seems pretty evident that it was a perception of Shostakovich's intended sentiment that Bartok was sending up (by the way, in a brilliant parody of the Hollywood style) rather than the symphony per se. That’s evident because the Giuoco delle coppie seems to lift elements (the drum, the passing of solos from one woodwind instrument to the next) that he would have heard in the Shostakovich—though hardly for the first time. To tell the truth, there are passages in the seventh symphony that pall. The very hungry musicians who participated in the work's premiere needn't have cared about that. The tremendously positive drive initiated in the first movement's 'invasion' passage sustains its power well beyond its immediate denouement, crunching though it is, in the first movement. Despite those lulls, which arise especially in the finale, the last passage builds to the most staggeringly searing climax, which Järvi manages with an assured ferocity that dissolves any remaining doubts about this mighty symphony’s communicative power.